Demonetisation got popular support initially, but patience soon ran out. It dealt a massive blow to the Indian economy, and 99% of the currency came back. New Delhi: No one is likely to forget Prime Minister Narendra Modi’s announcement from exactly two years ago in a hurry. It was at 8 pm on 8 November 2016 that the PM beamed on our TV screens to announce that high value currency notes worth Rs 500 and Rs 1,000 were being withdrawn with immediate effect. In a single stroke, 86 per cent of the total worth of India’s currency was rendered void. Demonetisation did get popular support in the initial phase, but public patience soon ran out thanks to the continued cash crunch. And while the massive blow it dealt to the Indian economy may be over, many have been left questioning the efficacy of the exercise, with 99 per cent of the total invalidated currency coming back into the system. According to the Reserve Bank of India’s annual report, Rs 15.31 lakh crore out of the total Rs 15.44 lakh crore that was sucked out of the system has come back. Experts such as Gita Gopinath, the new chief economist of the International Monetary Fund, had even said that such a move would not be prescribed to any developing or developed economy. No one, barring a few senior ministers and a select group of bureaucrats, had any idea that the Prime Minister had taken the decision to demonetise the banknotes until late in the evening. A hurried Cabinet meeting was held after 6 pm, where ministers were asked to keep their cellphones switched off to ensure that the information was not leaked. No banker was taken on board and no prior arrangements were made. The NDA government said that demonetisation was necessary to contain black money circulation. Besides, the move was aimed at containing counterfeit bank notes, which also helped in terror funding, Modi and his ministers said. Later, the government also said that the move was necessary to wean people away from physical cash, which in turn led to black money circulation. With cash drying up at bank branches and ATMs unable to dispense money, panic and uncertainty hit people. 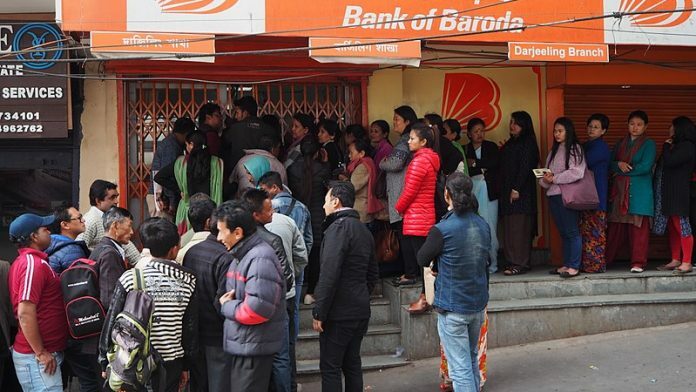 Thousands queued up at bank branches and ATMs over weeks and months to withdraw cash and even return the defunct bank notes in the initial phase. The sudden announcement gave no opportunity to banks to make adequate arrangements. Serpentine queues and lack of adequate medical services led to utter distress among people, and even loss of lives. Estimates suggest that about 100 people died as the mayhem hit every nook and corner of the country. The issue naturally turned political with the opposition parties launching a scathing attack on the NDA government. The government, however, has maintained that there is no direct correlation between the deaths and demonetisation. The move crippled India’s cash-driven economy in more ways than one. The GDP growth rate, which was 8.01 per cent in 2015-2016, fell to 7.1 per cent in 2016-2017 and 6.7 in 2017-18, mostly due to demonetisation. A study by the Centre for Monitoring Indian Economy (CMIE) revealed about 1.5 million jobs were lost during the January-March quarter of 2016-17, immediately following the note ban. The informal sector was the worst hit, including many micro, small and medium enterprises. While there is no exact estimate of the overall cost available, independent analysts have put it at over Rs 2 lakh crore. The cost of printing new notes for RBI was Rs 3,421 crore in 2015-2016. It escalated to over Rs 7,965 crore in 2016-17. Modi, in his televised address, said the move would help in weeding out fake notes. And while the overall detection has indeed fallen, there has been a significant increase in fake notes detected in the new Rs 500 and Rs 2,000 notes. A total of 17,929 fake notes of Rs 2,000 have been detected in 2017-18, compared to just 638 pieces in 2016-17. In the case of the new Rs 500 notes, 9,892 counterfeits were detected in 2017-18 — a 4,178 per cent jump from 199 in the previous fiscal. Finance minister Arun Jaitley, while presenting the Union Budget 2018, said demonetisation was celebrated by honest taxpayers as ‘imandari ka utsav’ (festival of honesty). In March 2014, there were about 4 crore income tax payers. The number rose to about 5.43 crore in 2017, and 6.84 crore by the end of March 2018.